Looking for a Used Accord in your area? CarGurus has 78,715 nationwide Accord listings starting at $999. 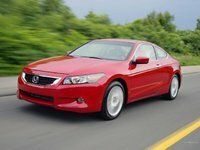 Honda gave its popular Accord midsize sedan a complete redesign for 2008, resulting in a larger vehicle with a roomier and better-equipped interior that borrows elements from the upscale Acura, and added a more powerful yet fuel-efficient V6 engine for the Accord's top-of-the-line trims. While Honda's goal was to add some excitement and sophistication to the Accord's exterior design, some drivers and reviewers find the 2008 sedan's exterior appearance derivative, and the new six-point grille has been controversial, with some drivers liking it and others feeling it detracts from the Accord's looks. The 2008 Honda Accord's refresh was sorely needed, and while the new exterior design doesn't quite match the overall look of some of the Accord's competitors, it gives the family sedan a little pizazz while retaining all the elements that have made the Accord so popular, like its overall quality, reliability, fuel efficiency, and smooth ride. 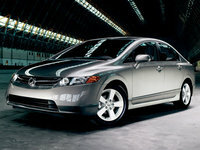 Borrowing design cues from the upscale Acura, Honda gave the Accord a much-needed redesign and interior update for 2008. The popular midsize sedan now delivers more of just about everything compared to the previous year's Accord. The completely new, more aggressive exterior design features such elements as a six-point grille, swept-back multi-reflector halogen headlights, dual chrome exhaust pipes, and wide-opening doors that make it easier to climb into and out of the vehicle. 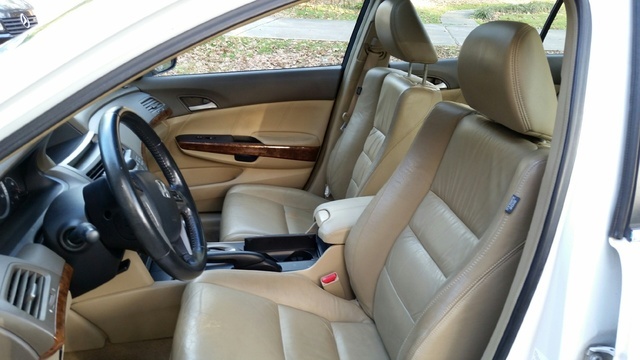 Honda also stretched the '08 Accord by more than three inches overall, widened it by an inch, and raised it an inch taller, resulting in the most interior room ever for an Accord. In fact, based on its interior space, the EPA actually rates the new Accord as a full-size sedan. The '08 Accord also receives more interior features and more power than the previous year's version, with a choice of three engines, including a new 3.5-liter, 268-hp V6 engine that delivers more horsepower than the entry-level Acura TL. Honda has simplified the Accord's lineup for 2008, doing away with the SE trim and slimming the offerings to just six trims, including the entry-level LX and LX-P trims, the mid-level EX and EX-L trims, and the top-of-the-line, V6-powered EX V6 and EX-L V6 trims. The Honda Accord has consistently been ranked as one of the best overall cars available today, and that trend continues with the '08 version. Car and Driver tapped the '08 Accord as one of the 10 Best of the Year (a list the Accord routinely makes), and U.S. News and World Report ranked the '08 Accord number 1 out of 25 Affordable Midsize Cars. 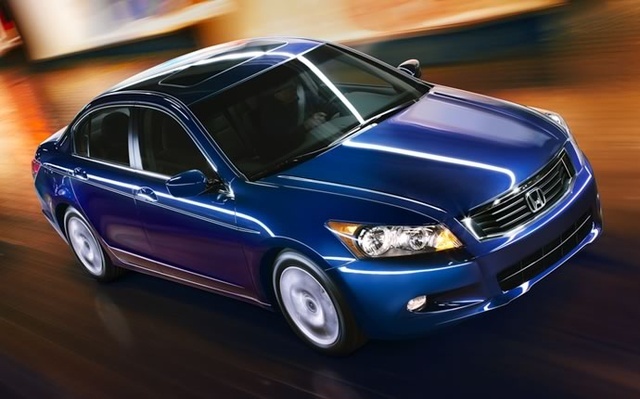 The '08 Accord also received awards and recognition from Motor Trend (Best Family Sedan), Kiplinger magazine (Best in Class), and Consumer Reports (Best Pick of 2008 in the Family Sedan category), among many other accolades. All '08 Accords feature front-wheel drive and run on regular unleaded gasoline. Powerplants start with a 177-horsepower, 2.4-liter i-VTEC four-cylinder engine with variable valve timing, which comes standard on the lower-end LX and LX-P trims. For the EX and EX-L trims, Honda bumps standard power for the 2.4-liter four-cylinder engine to 190 hp. At the top of the line, a new 3.5-liter iVTEC V6 engine, which powers the EX V6 and the EX-L V6, delivers 268 hp. The high-end V6 engine features Variable Cylinder Management, which activates or deactivates the engine's cylinders as needed to provide additional power for acceleration or conserve fuel at cruising speeds. When running on three cylinders (for light urban driving), the Accord's audio system generates out-of-phase sound waves to mask any undesirable engine noises, while active engine mounts keep engine vibration from reaching the cabin, no matter how many cylinders are in operation. Standard engine features across the line include multi-point fuel injection, a Direct Ignition system, and a Drive-by-Wire throttle system, which operates electronically using a sensor rather than mechanically. On four-cylinder trims, the engine links to a five-speed manual transmission. For V6 trims, the transmission upgrades to a five-speed automatic transmission designed for smooth shifting, optimal fuel economy, and responsive acceleration. The automatic transmission is available as an option on the lower-end trims. Perhaps due to its longer and heavier body, the Accord with the four-cylinder engine doesn't jump off the mark quite as fast as it once did, clocking in at 0 to 60 in 7.9 seconds, as opposed to 7.5 seconds for the previous year's Accord. Still, few would call the four-cylinder Accord underpowered, and some reviewers actually prefer the four-cylinder to the V6, noting that it's an overall better match for the family sedan. Naturally, the four-cyclinder also posts better fuel-economy rates, averaging 25 mpg (22/31 mpg) with the manual transmission. 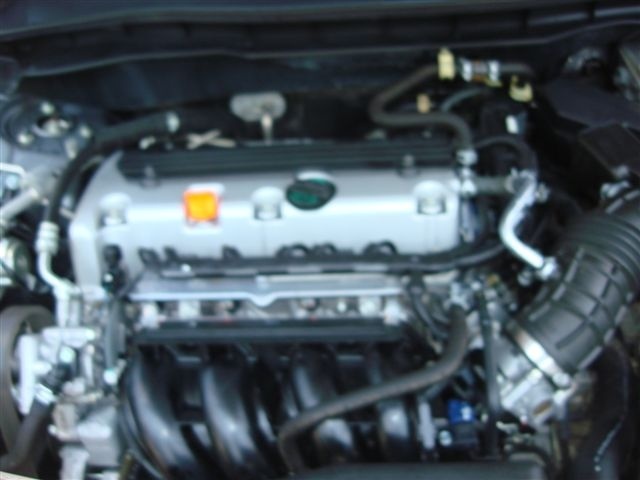 The V6 engine, thanks to Variable Cylinder Management, manages 19/29 mpg, with an average of 22 mpg. According to most drivers and reviewers, the '08 Accord handles competently and with a certain amount of precision, although some find it behaves less ably when pushed hard. This seems fitting with the Accord's role as a family sedan rather than a speed racer. Still, Honda has reduced body roll by positioning the engine and fuel tank lower in the vehicle, which helps improve the overall ride. The '08 Accord delivers a smooth, stable ride, thanks to its double wishbone front suspension and multilink rear suspension. 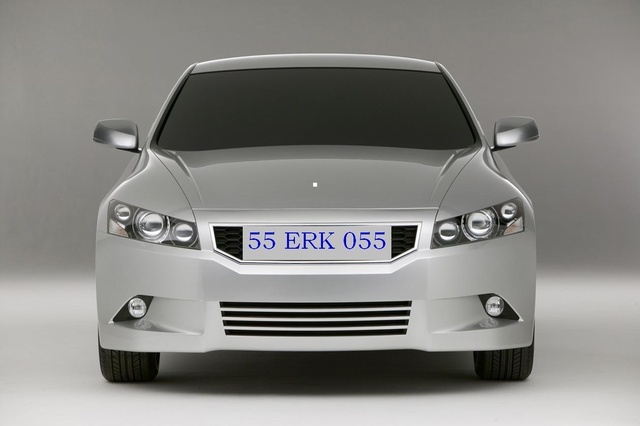 The suspension also has been designed for competent cornering as well as emergency manuvering. Power-assisted rack-and-pinion steering with Variable Gear Ratio comes standard. And the steering system delivers tighter inputs for better maneuverability in tight spots like parking lots. Features such as unibody construction, all-season tires, and 16-inch wheels (17-inch on the EX and EX-L trims) help ensure a smooth ride. 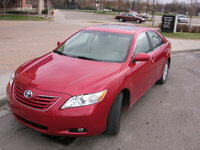 However, some drivers note that, like previous models, the '08 Accord generates a certain amount of road, tire, and wind noise, especially a highway speeds, and some drivers have even noted problems with rattles in their cars. On the positive side, reviewers praised the new Accord's firm but compliant ride, ranking it at a higher level of sophistication than its competitors. Drivers will find a lot to like about the '08 Accord's cabin, starting with more space overall. An inch or more has been added to the backseat, for instance, providing more leg and knee room. In addition, Honda has borrowed some design elements from the Acura, creating a more luxurious cabin, especially in the upper-level trims. Such features as remote keyless entry, cruise control, and illuminated steering-wheel-mounted audio controls come standard on all trims, and an eight-way power-adjustable driver's seat comes standard on all trims except the entry-level LX. Honda adds a one-touch power moonroof to the standard equipment list for EX and EX-L trims, while leather-trimmed seats, heated front seats, a leather-wrapped steering wheel, and dual-zone climate control come standard on the EX-L trims. Options include a navigation system with voice activation and Bluetooth HandsFreeLink, which enables drivers to make hands-free calls with many compatible phones (available only on the EX and EX-L trims). LX and LX-P trims come equipped with a 160-watt AM/FM/CD audio system with six speakers. EX trims add a six-disc in-dash CD player, while the EX-L upgrades the entertainment quotient with a 270-watt AM/FM premium audio system with a six-disc in-dash CD changer and XM Radio. All Accord audio systems feature an auxiliary input jack for MP3 players. Despite the fact that the Honda Accord has a larger footprint for 2008, trunk space remains unchanged, at 14 cubic feet, although the rear seats can be folded down to provide additional cargo space. However, the rear seat does not split, which limits the versatility of this feature. Overall, drivers and reviewers like the new Accord's cabin, ranking it a step above the interiors in competitors' vehicles. Backseat legroom, cabin materials, and the audio system in particular have been given high marks by drivers. Honda has made safety a priority across its entire line. The Accord comes standard with antilock brakes, traction control, brake assist with electronic brakeforce distribution, and stability control, as well as a wide range of airbags, including side-curtain airbags front and back. Honda also redesigned the front end to reduce injures in case of collision with a pedestrian. The '08 Accord was named a Top Safety Pick by the Insurance Institute for Highway Safety. The highest rating possible, this indicates that the Accord does a good job of protecting passengers in the event of a front, side, or rear crash. The 2008 Honda Accord has generated consistently high marks from drivers and reviewers. The Accord's interior spaciousness in particular, as well as its good gas mileage, smooth ride, and well-equipped cabin, as well as its overall quality, all were noted by drivers. Users like the manual transmission, and many prefer it over the automatic to unleash the full potential of the Accord. Overall, they seem to like the new exterior design, and an overwhelming majority of drivers feel the Accord delivers good value. On the downside, some CarGurus drivers found fault with the Accord's limited trunk space, and a few found the engine noisy. One driver in particular felt the dash was a little too stuffed with gadgets and knobs. On the positive side, users feel the Accord stacks up well against its competitors,including the Toyota Camry, the Nissan Altima, the Mazda 6, and the Chevrolet Malibu. Most drivers, as well as reviewers, seem to agree that the Accord remains the benchmark for the midsize sedan market segment. What's your take on the 2008 Honda Accord? 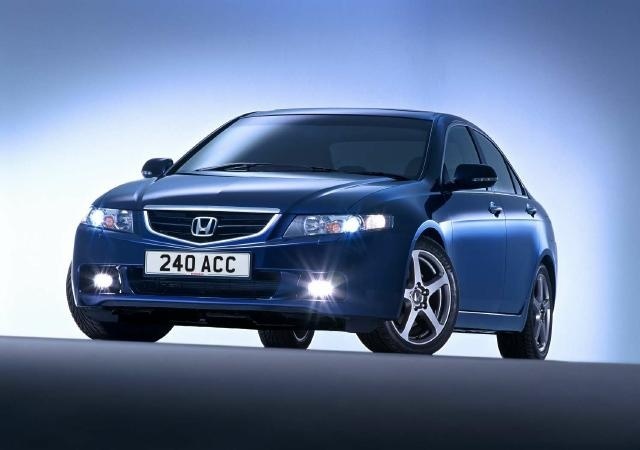 Users ranked 2008 Honda Accord against other cars which they drove/owned. Each ranking was based on 9 categories. Here is the summary of top rankings. 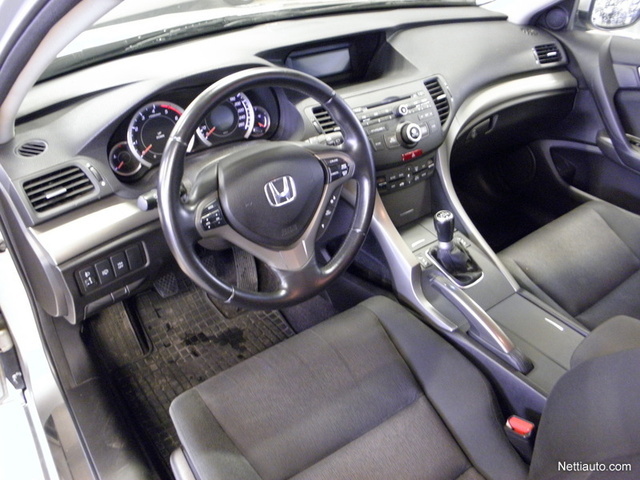 Have you driven a 2008 Honda Accord?